Not only have I been busy making crafts for the fairs I am working and planning classes, but I have also been teaching classes. It is a nice break from the assembly line mentality I have been focused on lately. On Saturday, I had the pleasure of teaching a Mother-Daughter Workshop and it couldn't have gone better. The girls were just the cutest and their mothers were so nice and friendly. It was just the break I needed. We made post it note holders from acrylic frames, with matching princess pens (which seems to be missing from my pictures for some reason) and bag to carry their projects home. They loved the princess theme and all the sparklies and pink. 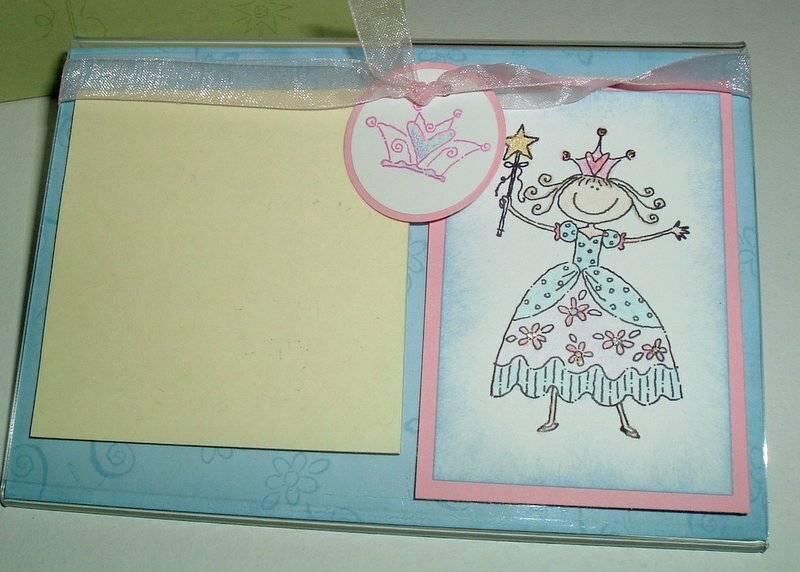 We used the Pretty Princess stamp set, perfect for any princess and beautiful Light Pink Organdy Ribbon. And at $4.95 for 25 yards, it is quite a deal. The little girls wanted to do everything themselves which was just adorable. It was like witnessing a crafter being born! Every month I am trying to offer a kids class. Next month, we will be making diaries complete with lock and key. I quickly purchased enough diaries to keep me well stocked because my "source" has been selling out since I opened my big mouth and shared the secret. I have already made up a sample project too, so I am sure a picture will be posted soon. Last week, I saw these amazing projects with Etched Glass using stamps and I had to try. I had to go to two different Michaels to find the supplies but I was determined to do it and see just how easy it really was. All I have to say is that not only is it truly simple but the results are AMAZING! My new Frosty candle holder is too cute! You can see a picture HERE. Blogger does not let me upload pictures lately. And I made another with a beautiful rose and it looks even better. (my second attempt) All it needs is a green candle inside to complete it. Now I am trying decide if I should sell off little Frosty this weekend and see if people will buy him and what they would pay. This would be a nice "gift" idea and I think people sometimes look for gifts for those hard to please people or hostesses when they attend craft fairs. Or maybe that's just me. I had a Halloween Treat Workshop last night and we made 5 different projects to dress up our candy and get it ready for all the little trickster that will be ringing our bells in a couple weeks. One of the projects will be this little nugget candy box. 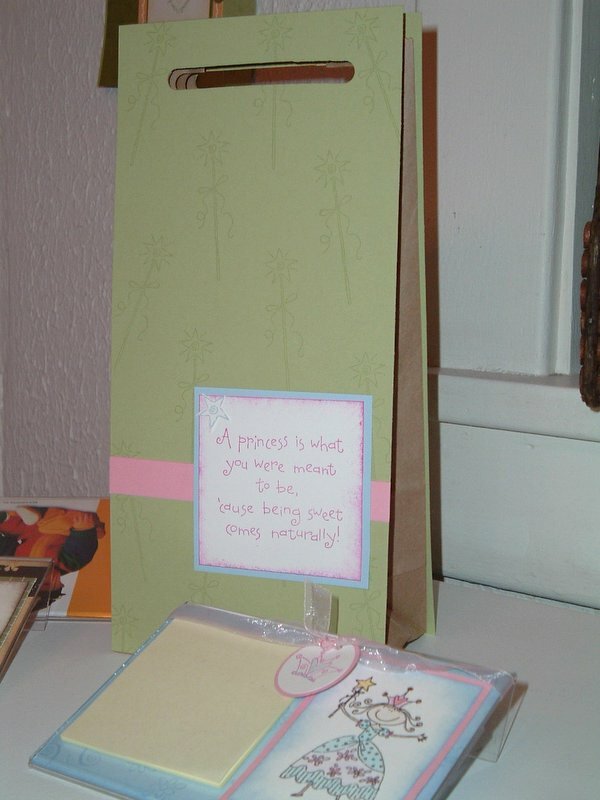 I just love how it is a complete project, cute little box and matching candies...perfect. The little tag is made with the great Tag Punch and the spider is from the Tags So Much hostess stamp set. Want that stamp set? Have a party and get it FREE. 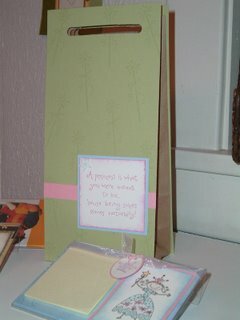 I am also selling the little nugget candy boxes and these pencil pouches at the craft shows. I sold them at the last one I worked and they were a big hit. People are always looking for stocking stuffer ideas or little gifts for your kid's friends or neighbors. They are packed with Holiday or Halloween pencils and pixie stix. You wouldn't believe how hard it was to find pixie stix! The cool mummy ribbon on the Halloween pouches is from the Target dollar spot, what a great find that was! In between all these projects, classes and fairs, I still need to get a costume for the kid or at least get an idea. He is always good at coming up with cool ideas like last year, but I think this year he just wants to be something gross like all the other boys instead of ingenious. So, I am conceding...plus, I am way to tired to try to convince him otherwise. These are so fabulous, I wish I lived near you. Awesome stuff, girlie!! Love it! okay, you have got to tell me how you did the glass etching. i have all the supplies, just tell me how you did the stamp. okay, i'm emailing you now...lol. btw...you are sto stankin' fab-boo.